Oregon doesn’t have many easy games in the month of November and Army just happened not be one of those easy ones. The No. 5 Ducks opened their season with a 91-77 win over the Black Knights in front of a capacity crowd of 12,364 inside Matthew Knight Arena. Coach Dana Altman, who just signed a seven-year extension, experimented with several combinations as the Ducks are trying to quickly figure out the best rotations possible before the competition increases dramatically. The Ducks seemed to work best when Tyler Dorsey, Jordan Bell and Payton Pritchard were on the floor. Dorsey led all scorers with 21 points, Bell stuffed the stat sheet with 14 points, six blocks and eight rebounds. As far as the true freshman from West Linn, Pritchard had an impressive debut with 15 points. Oregon was missing Dillon Brooks, who is still out with a foot injury, and MJ Cage will have to wait to make his debut as a Duck while going through concussion protocols. The Ducks won’t have long to get ready for Baylor, their next opponent, as they will face the Bears Tuesday in Waco, Texas for a 12:30 pm tip as part of a marathon of games televised by ESPN. 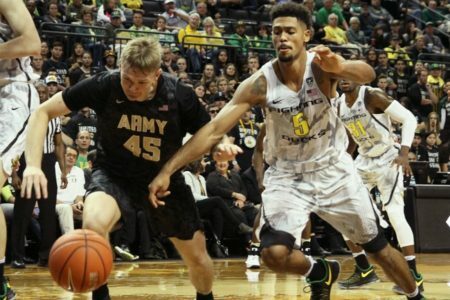 The post Ducks Dump Army 91-77 appeared first on DuckNews.com.